The announcement by the Railway Ministry to increase rail freight rates in a number of commodity slabs, including coal, will increase the power generation cost in Punjab. Officials of the Punjab State Power Corporation Limited (PSPCL) said the hike in rail freight for the coal would definitely add to the existing power generation cost, thereby leaving the Power Corporation with no other option than to approach the Punjab State Electricity Regulatory Commission (PSERC) to increase the power tariff. In a significant development, which would drastically reduced the pollution level in the critically polluted industrial town of Mandi Gobindgarh, more than 100 forging units and steel rolling mills signed an agreement with the Gas Authority of India Limited (GAIL) to shift their fuel from coal to gas. Workers at a steel rolling mill in Mandi Gobindgarh. Gurdaspur MP Partap Singh Bajwa has said that the party leadership’s failure to mollify rebels led to the Congress defeat in the assembly elections. Partap Singh Bajwa and his wife Charanjit Kaur Bajwa, who has won from Qadian, were here to attend the bhog of Congress MLA Kanwarjit Singh Brar “Sunny”. “When campaigning was on, I kept saying that the party leadership must focus on rebels. But not much was done,” Bajwa said. n The 20-acre historic battle-ground of Chappar Chiri, dedicated to Baba Banda Singh Bahadur for defeating the Mughals 300 years ago, all set to host the swearing-in of Punjab's new Cabinet on March 14. Former PCC chief Virender Kataria today said one of the major reasons for the Congress defeat was the PCC chief’s inaccessibility to the common man. Contrary to popular perception that votes polled by the People’s Party of Punjab (PPP) was the primary factor for the Congress defeat in Punjab, the PPP secured the 3rd, 4th, 5th and 6th position in the 90 assembly segments that it contested in alliance with the Sanjha Morcha. Punjab Congress chief Amarinder Singh today asked Parkash Singh Badal, who is set to take oath as CM on March 14, to rein in police officials, accusing them of victimising Congress workers to please their political masters. Politics seems to be an extremely profitable field. So much so that it can even defy the global slowdown. This at least appears to be the case in Punjab where the number of crorepati legislators has increased from 77 in 2007 to 101 in the current assembly. Civil servants, both retired and serving evoked a mixed response from electors of Punjab in the just concluded Assembly elections. A nuclear physicist, Hardev Singh Vir, would be conducting an independent study on the source of uranium and to ascertain whether it is to blame for the high incidence of cancer cases in the area. The time when the official machinery was preoccupied in assembly polls, there was a group of real estate barons busy selling plots in illegal colonies that mushroomed in the town in recent months. The realtors, it has been learnt, were allegedly patronised by politicians of both the ruling SAD-BJP alliance and the Congress. The illegal colonies mushroomed after the Punjab cabinet’s decision on December 10, 2011, to regularise the already established unauthorised colonies within all municipal limits in the state. The Punjab Pollution Control Board (PPCB) today raided 20 industries in Jalandhar. As per preliminary reports, five industries were found violating various provisions of the Water (Prevention and Control of Pollution) Act, 1974 and Air (Prevention and Control of Pollution) Act, 1981. Giving details, board chairman Ravinder Singh said that the board had already made it compulsory for all the electroplating industries of Jalandhar to get their effluent lifted by the JBR Technology Pvt Ltd, Ludhiana for the treatment of effluents in the Common Effluent Treatment Plant (CETP) installed at Ludhiana till the time the CETP in Jalandhar gets commissioned. Censuring the Punjab government once again for the failure of its law officers to appear before the court for assisting the Bench in cases against the government, the Punjab and Haryana High Court has made it clear that the cases can be decided on merits without hearing the state counsel. The police has solved the murder case of 52-year-old Assistant Sub Inspector Harbhajan Singh. His body was found near Chapa village, Barnala, last month. Leading cardiologist Dr GS Wander was attacked by unidentified assailants near the Barnala-Tapa highway near Bathinda this evening. Prem Gupta, secretary, Dayanand Medical College and Hospital, said Dr Wander, chief cardiologist, Hero DMC, was returning to Ludhiana after attending a conference in Bathinda at 5pm when unidentified persons in a car intercepted Dr Wander’s vehicle. The announcement by the Railway Ministry to increase rail freight rates in a number of commodity slabs, including coal, will increase the power generation cost in Punjab. Officials of the Punjab State Power Corporation Limited (PSPCL) said the hike in rail freight for the coal would definitely add to the existing power generation cost, thereby leaving the Power Corporation with no other option than to approach the Punjab State Electricity Regulatory Commission (PSERC) to increase the power tariff. Henceforth, the impact of the decision would be on all categories of the power consumers, especially the industrial sector in the state, which is already passing through a bad phase. As per the projections made by the PSPCL in its Annual Revenue Requirement (ARR) filed for the financial year 2012-13, the total coal requirement for the thermal plants in Punjab for the next fiscal would be 125.9 lakh tonnes. The present transportation cost for coal is approximately Rs 1,500 per metric tonnes (MT). The hike of about 20 per cent rail freight for coal would increase the transportation cost to approximately Rs 1,800 per MT. The thermal power generation for 2012-13 in the ARR has been projected to be 17,375 million units (MUs). Henceforth, according to rough estimates, the total increase in the cost for power generation would be Rs 378 crore annually. In simpler terms, the net additional increase of power generation cost would be approximately 20 paise per unit. Speaking to The Tribune, PSPCL Director Generation GS Chhabra said, "There is no escape route, as the decision has been taken by the Ministry of Railways. On account of the increase in the rail freight for coal, PSPCL will work out how much the total cost will go up. Subsequently, the Power Corporation would file a supplementary to the Annual Revenue Requirement (ARR) for the 2012-13 with the PSERC." Experts in the power sector said that in view of the fact that the power generation in Punjab was primarily thermal based, the decision to increase the rail freight rates for coal would have direct impact on the power generation cost. Since, Punjab get major chunk (90 per cent) of coal from Jharkhand, the additional financial burden on Punjab would be more than other states, due to distance between Punjab and Jharkhand. Meanwhile, the decision has left the industry high and dry. Strongly flaying the decision, president of the Federation of Punjab Small Industries Association, Badish K Jindal said, "The increase in coal freight to the tune of 18-24 per cent for different distance slabs will lead to costlier power, which is bound to adversely effect the industry, which is already passing through bad phase." Speaking to TNS, general secretary, Chamber of Industrial and Commercial Undertakings (CICU) Avtar Singh said that the small-scale industry would be the worst affected. "The Union Government must review the decision, otherwise the industry in Punjab will not survive", he said. President, Apex Chamber of Commerce and Industry, Punjab, PD Sharma said, "At least the PSPCL should curtail its expenditure on the manpower, as has been directed by the PSERC and the state government. This would improve fiscal health of the cash-strapped PSPCL, which will be good for the industry." Padamjit Singh, a power sector expert, said that the decision of the Railway Ministry would not only affect the industry, but the general public as well. "It is presumed that instead of increasing the fare for the passengers, the Railway Ministry increases the rail freight. But if power generation cost will go up, it will lead to hike in power tariff, which would directly affect both the domestic as well as industrial consumers. The burden for the costlier power will have to be borne by industry and the commoners." The announcement to increase the rail freight for coal is second blow for the Punjab in a month. Sometime back, the Coal India had communicated to the developers of the upcoming Rajpura and Talwandi Sabo thermal plants that they wanted to amend some clauses of the Fuel Supply Agreement (FSA) to be signed between the coal supplier and the developer. It is learnt that citing shortage of domestic coal supply, the Coal India subsidiaries had verbally communicated to the developers of the thermal plants that they should accept the induction of a clause in the FSA that the supply of coal would be "domestic" and if required "imported" as well. Since, the cost of the imported coal is more than the domestic, in case the developer agrees to the Coal India condition, the cost of the power generation in the state would up, which means costlier power for the consumers. In a significant development, which would drastically reduced the pollution level in the critically polluted industrial town of Mandi Gobindgarh, more than 100 forging units and steel rolling mills signed an agreement with the Gas Authority of India Limited (GAIL) to shift their fuel from coal to gas. The decision to sign the agreement came after functionaries of the Punjab Pollution Control Board (PPCB) made persistent efforts to convince industrialists that gas would be a better option and it would bring down the pollution level. Convinced with the board efforts, about 109 forging, steel rolling mills and furnaces had signed an agreement with the GAIL in the last week of February. During the past one decade, the pollution level in the town has witnessed a steep increase. On account of air pollution, a considerable number of residents have been suffering from various health ailments, particularly bronchitis, eyes and respiratory problems. In view of the high pollution level in the town, couple of years back, the Central Pollution Control Board (CPCB) had instructed the PPCB to send a periodical report of the "review" of the action taken by the departments, responsible for checking and curtailing pollution in Mandi Gobindgarh. After having lot of deliberations, the PPCB functionaries chalked out a comprehensive strategy to bring down the pollution level in Mandi Gobindgarh. The main focus area was to get gas as fuel for the steel rolling mills and furnaces, instead of the coal. Speaking to TNS, board chairman Ravinder Singh said, "Since coal ignition pollutes the environment, our emphasis was to ensure that industry in Mandi Gobindgarh shifts to gas as the fuel. The PPCB prepared a proposal for the steel rolling mills and forging units, using coal as fuel, to convert their units on gas. The top brass of the board held many meetings with the Rolling Mill Association, Forging Association and GAIL officers to get the agreement signed." SP Sharma from GAIL said that the natural gas would be supplied to the industries of Mandi Gobindgarh from the Dadra-Bawana-Nangal gas pipeline, which passes through Amloh. "The work for laying the pipeline so that the industry gets gas supply will be completed within a period of six months. After the conversion of coal-fired furnaces to the gas-fired furnaces and the rolling/forging units, the air pollution level from these industries will be negligible", he said. Gurdaspur MP Partap Singh Bajwa has said that the party leadership’s failure to mollify rebels led to the Congress defeat in the assembly elections. Partap Singh Bajwa and his wife Charanjit Kaur Bajwa, who has won from Qadian, were here to attend the bhog of Congress MLA Kanwarjit Singh Brar “Sunny”. “When campaigning was on, I kept saying that the party leadership must focus on rebels. But not much was done,” Bajwa said. Asked if he would be willing to hold the post in case the high command removed the PCC chief, Bajwa said he was not interested in the post. He said everything was in the hands of the high command and declined to say anything further. Rajinder Kaur Bhattal, who met AICC chief Sonia Gandhi in Delhi yesterday, remained tightlipped. Once known as a firebrand leader, she said: “The defeat is unfortunate and I am unable to understand the reasons for it.” Among others leaders at the bhog were Adesh Partap Singh Kairon, Jagmeet Brar, Avtar Brar, Amrinder Singh Warring “Raja”, Avtar Henry, Harnirpal Singh “Kukku”, Gurcharan Ghalib and Babbu Singh Maan. n	The 20-acre historic battle-ground of Chappar Chiri, dedicated to Baba Banda Singh Bahadur for defeating the Mughals 300 years ago, all set to host the swearing-in of Punjab's new Cabinet on March 14.
n A galaxy of VVIPs, including LK Advani and other senior leaders of the BJP and Chief Ministers of Himachal , Pradesh, Haryana, Rajasthan and Gujarat are expected to attend the function. n There will be three stages, one for the swearing-in ceremony, second for the Sant Samaj and other religious leaders and the third for political persons and eminent personalities. n The PWD and the GMADA officials are making arrangements to accommodate more than 12,000 persons. Four separate parking lots wil accommodate 8,000 vehicles during the function. n To keep a check on law and order during the ceremony on March 14, at least 1,500 police personnel from Mohali and neighbouring districts of the state have been requisitioned by the authorities. He said Capt Amarinder Singh remained inaccessible even to senior leaders with some ‘tainted’ persons coming in the way. The PPP chief, Manpreet Badal, was third in both Gidderbaha and Maur. Many PPP candidates lost their deposit. The highest number of votes that the PPP secured were by Didar Singh Bhatti, who joined the PPP after he was denied the SAD ticket. He secured 28 per cent votes, yet he finished third. Of the 90 seats it contested, the PPP candidates got less than 1,000 votes in seven. On another 16 seats, they secured between 1,000 and 2,000 votes, on 21 seats the PPP polled between 2,000 and 5,000 votes and on 29 seats between 5,000 - 10,000 votes. There were only eight seats where the PPP secured between 10,000 and 20,000 votes and nine where it got over 20,000 votes. At best, it can be said that there were 20-odd seats where the PPP candidates had some presence. It is creditable that the PPP candidates secured the third position in 51 of the 90 constituencies it contested. But on most seats the votes they polled varied from 0.99 per cent to 11 per cent.There were a few exceptions where the poll percentage hovered around 20 per cent. On only two seats it got 28.75 per cent (Fathegarh Sahib) and 25.62 per cent (Muktsar) votes. Again it would be wrong to say that the PPP did well in Malwa. In Ludhiana South its candidate Vibhor Garg secured only 496 votes and was placed 7th, in Ludhiana East PPP’s Daljit Singh got 912 votes and finished 5th, in Ludhiana North PPP candidate Anand Sharma secured 1,544 votes and finished 5th. In Dera Bassi PPP’s Bhagwant Singh finished 6th with 2793 votes. In contrast, Deepinder Singh Dhillon, a Congress rebel who contested as an Independent, got 51,248 votes, the highest by an Independent in these elections. He lost to SAD’s NK Sharma. Three victorious Independents Balwinder Singh Bains (Ludhiana South) secured 49,594 votes, Simarjit Singh Bains (Atam Nagar) 51,063 and Rajnish Kumar (Mukerian) 53,951. Even in Ferozepur (Urban), where the PPP was considered to be strong, its candidate Parminder Singh Pintu secured 1,536 votes and was placed 4th. In Doaba and Majha, the PPP performance was even more dismal. In Amritsar (South) PPP nominee Jasbir Singh secured only 277 votes. In Ajnala the PPP got a mere 695 votes. Martyr Bhagat Singh’s nephew Abhey Singh Sandhu, who was the PPP candidate from Nawanshahr, obtained 8,947 votes and secured the 4th position. His vote share was a mere 7.63 per cent. The PPCC chief claimed he had received reports from defeated party MLAs across the state that their workers and supporters were being harassed and victimised by Akali workers and the police. That the economic recession has not touched the politicians, particularly those from Punjab, was clear from the fact that there was a whopping 66 per cent increase in the number of crorepati MLAs in a short span of five years (between 2007 and 2012). Of the newly elected crorepati legislators, 47 were of the SAD, 41 of the Congress, 10 of the BJP and three contested as an Independent. The average assets of the Punjab MLAs came to around Rs 9.92 crore whereas those of the Congress legislators were pegged at Rs 13.97 crore. The SAD MLAs trail at Rs 7.93 crore, followed by those of the BJP at Rs 4.68 crore, said a research conducted by the Association for Democratic Reforms and Punjab Election Watch. The two bodies were associated with the National Election Watch, a nationwide campaign comprising of more than 1,200 NGOs and other organisations working on electoral reforms, improving democracy and governance in India. As compared to Rs 9.17 crore in 2012, the average assets of these MLAs was around Rs 5.73 crore in 2007 and the average asset growth for the MLAs who re-contested this time worked out to be Rs 3.43 crore. The average percentage growth in the assets of the MLAs was 60 per cent, said Jaskirat Singh, coordinator of the two bodies that conducted the study on the basis of the affidavits of the winners submitted to the Election Commission. Congress MLA from Barnala Kewal Singh Dhillon recorded the highest increase in his assets as his fortunes grew by Rs 71.67 crore (from Rs 6.83 crores in 2007 to Rs 78.51 crore in 2012). He was followed by Adesh Partap Singh Kairon of the SAD from Patti constituency with an asset increase of Rs 30.41 crores (from Rs 20.81 crore in 2007 to Rs 51.23 crore in 2012). The assets of Sukhbir Badal (SAD from Jalalabad constituency) registered a growth of Rs 22.87 crores (from Rs 67.98 crore in 2007 to Rs 90.86 crore in 2012), the report said. The highest increase in terms of percentage was registered by Sunil Jakhar (Congress from Abohar) as his assets witnessed a growth of 1,256 per cent from Rs 50.45 lakh in 2007 to Rs 6.84 crores in 2012. He was followed by Navtej Singh of the Congress from Sultanpur Lodhi constituency with 1,057 per cent increase (from Rs 21.15 lakh in 2007 to 2.44 crores in 2012) and Kewal Singh Dhillon of the Congress with an increase of 1,048 per cent (Rs 6.83 crores in 2007 to Rs 78.51 crores in 2012). A total of 64 or just 55 percent of the total 117 winners were graduates or above. Of the 93 women candidates who contested, only 14 managed to win the polls. It meant that just 12 per cent of the MLAs in the assembly will be women. 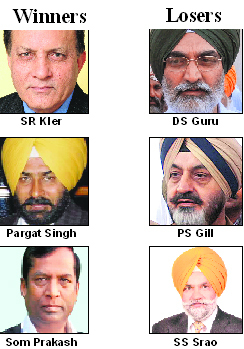 Though the 14th Punjab Vidhan Sabha would have more ex-civil servants than ever before, but defeats of some of the top bureaucrats, including Darbara Singh Guru, who was until late last year Principal Secretary to Chief Minister Parkash Singh Badal, and Paramdeep Singh Gill, who retired in September last year as Director General of Police, were stunning. While Guru was new to electoral politics, Gill had family background in politics. His father, late Nacchhattar Singh Gill, represented the same constituency - Moga - from where he lost to sitting MLA Joginder Jain in the recently held Assembly polls. It may also be a strange coincidence that PS Gill lost to a candidate of a party - Congress - that his father had represented. DS Guru lost to a political novice, folk singer Mohammed Sadique. Another civil servant to lose this time was SS Saraon, who finished runner-up to the Leader of Opposition Rajinder Kaur Bhattal. All the three defeated civil servants were candidates of the ruling Shiromani Akali Dal. These reverses apart, former bureaucrats Som Parkash, Shiv Ram Kler and policeman-turned Director Sports and Olympian Pargat Singh, scripted success stories in the 2012 elections. Som Parkash, who quit the Indian Administrative Service on the eve of 2009 General elections, had lost narrowly to Congress candidate Santosh Chaudhary in the subsequent Lok Sabha elections from Hoshiarpur. Now, three years later, he has been elected to the Punjab Assembly on the BJP ticket from Phagwara. Shiv Ram Kler, who retired from Punjab Civil Service, won from Jagraon. Contesting on SAD ticket, he, too, made a winning start in politics and has become the first from the PCS to be elected to the Punjab Vidhan Sabha in recent times. Both Som Parkash and Shiv Ram Kler have thus created history for civil servants to turn successful politicians. Pargat Singh, who had ended his association with the Police Department -- where he was a Superintendent of Police - in November last year, is thus become the first serving Director of Sports to be elected to the Vidhan Sabha. One retired Indian Revenue Service officer, too, made an unsuccessful attempt to enter Punjab Assembly from the Majha belt. Interestingly, not only civil servants, even their spouses, too, were in the fray. While wife of Mohammad Izhar Alam, former Director General of Police, won from Malerkotla on the SAD ticket, her rival, Razia Sultan, is wife of Mohammad Mustafa, a serving Additional Director General of Police. Razia Sultana was member of the 12th and 13th Punjab Vidhan Sabha. For the study, Dr Virk has collected drinking water samples from several villages, including Bhagi Vandar, Jaga Ram Tirath, Jajjal, Giana and Malkana, in Talwandi Sabo block of the district. “We have collected 12 samples from different sources, including hand pumps, tubewells and a well at Dera Natha in Giana village. At several places, we found hand pumps that the villagers claimed to have abandoned suspecting them to be the source of cancer,” said Dr Virk, a professor emeritus at the Eternal University Baru Saheb in HP. Dr Virk said these samples would be sent for analysis to Guru Nanak Dev University in Amritsar and to labs at Chandigarh and Mangalore. “We want to ascertain the exact cause of cancer so that corrective measures could be adopted,” Dr Virk, who has earlier studied radon and thoron levels in Punjab and Chandigarh under a Bhabha Atomic Research Centre research programme, said. The time when the official machinery was preoccupied in assembly polls, there was a group of real estate barons busy selling plots in illegal colonies that mushroomed in the town in recent months. The realtors, it has been learnt, were allegedly patronised by politicians of both the ruling SAD-BJP alliance and the Congress. The illegal colonies mushroomed after the Punjab cabinet’s decision on December 10, 2011, to regularise the already established unauthorised colonies within all municipal limits in the state. Investigations made by The Tribune revealed that at least 10 new colonies had come up during the last three months in and around the town. When the government had decided to regularise the illegal colonies, it had also announced strictest possible action against any such constructions in future. But, the local Municipal Council and the Punjab Urban Development Authority officials were yet to take any action. Sources said there was a nexus between the politicians, real estate developers and the bureaucracy. Most of the colonies were within the municipal limits at the district headquarters while a few of them were outside the local body limits that had come up recently. The illegal colonies had come up at Sant Nagar, behind the Gita Bhawan area near the DM College grounds, behind the petrol pump near the Nestle factory, Dosanj road, Kotkapura bye-pass road, Ferozepur road, Ludhiana road and also on the Baghapurana road in the town. Insiders in the business revealed that the real estate developers financed the local politicians of all major parties in the recent elections and the source of money was such illegal colonies. The Punjab Pollution Control Board (PPCB) today raided 20 industries in Jalandhar. As per preliminary reports, five industries were found violating various provisions of the Water (Prevention and Control of Pollution) Act, 1974 and Air (Prevention and Control of Pollution) Act, 1981. Giving details, board chairman Ravinder Singh said that the board had already made it compulsory for all the electroplating industries of Jalandhar to get their effluent lifted by the JBR Technology Pvt Ltd, Ludhiana for the treatment of effluents in the Common Effluent Treatment Plant (CETP) installed at Ludhiana till the time the CETP in Jalandhar gets commissioned. Ravinder said that contrary to the instructions, there were reports that electroplating units in Jalandhar were not getting the effluents treated at Ludhiana CETP. "To check violations, five teams headed by environmental engineers were directed to raid electroplating industries of Jalandhar," he said. During the raids, the board teams inspected premises of 20 industries minutely and found that five industrial units were flouting the pollution control norms. The irregularities being committed by erring electroplating industrial units include non-operational effluent treatment plant and the Air Pollution Control Devices (APCD). Besides inadequate suction arrangements were also found in some of the industrial units. Officials of the PPCB said as many as six electroplating units were found committing minor violations like inadequate facility for storage of hazardous waste, faulty water meter and poor housekeeping. "As per rules, appropriate action would be initiated against the erring electroplating industries", assured PPCB officers. The High Court has also called for intervention of the state Principal Secretary (Home) for ensuring the representation of the state during the hearing of the cases against it and its officials. The directions by Justice LN Mittal came on a petition filed by the Shivalik Co-operative Labour and Construction Society Limited in an arbitration matter. Justice Mittal observed: "No law officer of the State of Punjab is present in the court, when the case has been taken up for hearing. It is happening in many cases before this Bench that the State of Punjab is not being represented by any law officer, when the cases are taken up for hearing." "The matter has already been brought to the notice of the Advocate General, Punjab, but it appears that no remedial steps have been taken. In a case it was told that three law officers have been assigned to this Bench. But in spite thereof, there is no appearance on behalf of the State of Punjab in the instant case, when it has been taken up for hearing." "Accordingly, I have heard counsel for the petitioner and perused the case file and I proceed to decide the revision petition on merits…. A copy of this order be sent to the Punjab Advocate General and the Principal Secretary, Department of Home and Administration of Justice for appropriate action to ensure the representation on the behalf of the State of Punjab and its officers/ officials, whenever their cases are taken up". Only in March last year, Justice Mittal had minced no words while ruling that great difficulty and inconvenience was being experienced in Punjab cases. "Either the law officer does not appear, or the law officer is not prepared with the case, or the law officer does not have the necessary documents, forcing unnecessary adjournments". In a joint operation with the Sirsa police, three of the four suspects in the case were arrested today. During questioning, they confessed that the policeman was done to death by gangster Makhan Singh, alias Sooraj, and his men in a fit of rage. There are more than 60 FIRs registered against Makhan in various states. Barnala SSP Dhanpreet Kaur said: “You will have to wait for more details as more raids are on and a press conference will be held soon”. The murdered ASI was posted with the Barnala police at the Shehna police station. The police found his body at an abandoned brick-kiln on the Chapa Kutbaa road. His Zen car was found abandoned at the Chapa bus stand, 2 km away. When contacted, DIG LK Yadav (Patiala Range} refused to comment, claiming that they were close to solving the case. Initial probe suggests that the Makhan gang was looking for a victim when it saw the ASI’s car hit by a vehicle and offered help. “When the gang members realised that he was a policeman, they panicked and killed him there and then,” claimed an officer. Police teams have been sent to three possible hideouts to arrest Makhan. Leading cardiologist Dr GS Wander was attacked by unidentified assailants near the Barnala-Tapa highway near Bathinda this evening. Prem Gupta, secretary, Dayanand Medical College and Hospital, said Dr Wander, chief cardiologist, Hero DMC, was returning to Ludhiana after attending a conference in Bathinda at 5pm when unidentified persons in a car intercepted Dr Wander’s vehicle. Their faces covered, they attacked the doctor with hockey sticks and baseball bats. Dr Wander was rushed to DMC Hospital where his condition was stated serious. He has received injuries on the head, hands and legs. Dr SS Gill, SSP, Bathinda, was no available for comment.